This accessory adapts Baader Hyperion eyepeices to accept cameras via standard T-Rings for eyepiece projection photography. 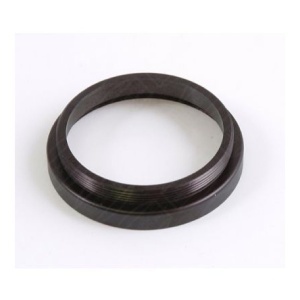 The Hyperion fixed focal length eyepieces (set, #B2454600) or the Mark-III 8-24mm zoom eyepiece (#B2454824A) feature a male M43 thread under the rubber eyeguard. This adapter converts this 43mm thread to a male T2 thread, you then need to purchase the T-adapter for your particular camera and then attach that stack to your camera. This can also be used in conjunction with #B2958130 variable locking T-2 extension, or any other fixed length T-2 extension tubes.